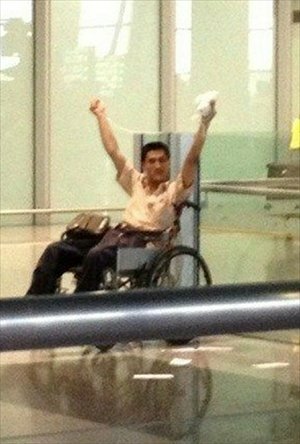 An explosion at the Beijing Capital International Airport Saturday night, set off by a wheelchair-bound petitioner, has triggered massive public discussion about possible solutions to the increasing number of violent incidents caused by various social conflicts. Ji Zhongxing, 34, originally from Shandong Province, was identified by the Beijing police as the man responsible for detonating a homemade explosive device at Terminal 3 of the airport Saturday night. He has been petitioning the authorities over his lower limb paralysis, which was allegedly caused by a beating from several security officers in Dongguan, Guangdong Province, in 2005. A witness told the Global Times that she saw Ji shouting and waving a white plastic bag from his wheelchair near Gate B at the arrival hall while he was trying to distribute fliers. Another witness said he heard Ji shout to ask people to stay away. The explosion broke Ji's left arm and caused a minor injury to a police officer, without any casualties. The press office of the airport told the Global Times that the scene was cleaned and the area resumed normal operations around two hours later. The public security bureau of the airport told the Global Times that further investigations are underway but declined to reveal Ji's whereabouts after the treatment. "I heard about it late last night. Investigators went to talk with my father today, but we didn't know about his plan or his current situation," Ji Zhongji, Ji's brother, who is working in Inner Mongolia, told the Global Times. A Sina blog, believed to have been written by Ji, described the details in which he and his passenger were beaten by several security officers in Dongguan while he was running a motorcycle taxi business in 2005, resulting in his paralysis. His civil lawsuit for compensation was dismissed in 2007 by a local court due to insufficient evidence. Local governments of Juancheng county in Shandong Province, Ji's hometown, and Dongguan issued two separate but contradictory statements Sunday regarding Ji's claims. Juancheng confirmed the beating and said it offered subsidies to him after the incident, while the Dongguan government said Ji "collided with the officers, fell down and got injured" and that there was no evidence of a beating in the preliminary investigation. Although Dongguan set up a special team Saturday night and vowed to conduct a thorough reexamination of Ji's claims, Web users were skeptical about the credibility of the team and said a third-party agency should conduct the investigation. Although there were no casualties, many Web users have drawn parallels between the case and the Xiamen bus explosion which claimed 48 lives on June 7, including Chen Shuizong, who is believed to have ignited the fire because of problems petitioning. Many people expressed sympathy toward Ji, but more insisted that suffering is not an excuse for extreme behaviors that harm public security. "It could be called 'individual terrorism,' because it led to social damage, had no clear target and was caused by social conflicts as well as individual frustration and psychological problems," said Wu Boxin, a criminology expert with the People's Public Security University of China. Such extreme cases have led to increasing doubts about the efficiency of the petition system that allows people to complain to specific government agencies. "Petitioning is only a supplement to the judicial system, but judicial injustice and limited channels to express grievances have made more and more people petition. However, most petitions still don't get a result," Wang Cailiang, a Beijing-based lawyer who has dealt with many petitioning cases, told the Global Times. The quick reinvestigation into Ji's case also brought up public fears of more copycats pursuing violence in order to get their requests noticed. However, this is an inevitable trend if local authorities don't face up to problems in governance and the judicial system, and continue to suppress petitioners to maintain stability, said Wu. Xue Zhaohui, Ji's lawyer in the civil suit, said the testimony of Ji's passenger and medical reports strongly suggested a beating took place, but it was still rejected by local courts, the Nandu Daily reported. "Many local courts are reluctant to hear these cases or make rulings in favor of the petitioners in order to avoid trouble when the government intervenes in judicial affairs," said Wang. An obvious solution, according to both Wang and Wu, is to strengthen judicial justice and pay more attention to living conditions at the grass-roots level. "However, it's hard and needs to start with lower level courts, where the problems are the most serious," said Wang. Ji Zhongxing is allegedly beaten by a group of security officers in Dongguan, Guangdong Province, leading to his paralysis. Ji petitions the local public security bureau in Houjie township. Ji lodges a civil action against the Xintang village committee, who hired the security officers, with a local court in Dongguan. The court rejects Ji's case. Ji then appeals to the Dongguan Intermediate People's Court. The Dongguan Intermediate People's Court upholds the previous ruling. Ji sends a petition letter to the Communist Party of China Central Committee's Political and Legal Affairs Commission. The local public security bureau in Houjie township provides Ji with 100,000 yuan ($16,293). Ji promises he will never petition again. The local bureau, which handles official complaints, receives a petition letter from Ji forwarded by the State Bureau for Letters and Calls, which was submitted by Ji via an online channel for the State agency. Ji sets off a homemade explosive device at the airport.